enter site The origins of the Soil Survey in California trace back beyond the first Soil Surveys of the U.S. Bureau of Soils to the founding of the study of Soil Science itself. California’s Eugene Hilgard at the University of California at Berkeley was a pioneer in many areas of Soil Science, and is referred to as the cofounder of Soil Science by Hans Jenny and others; he also developed an original vision for Soil Surveys in California. 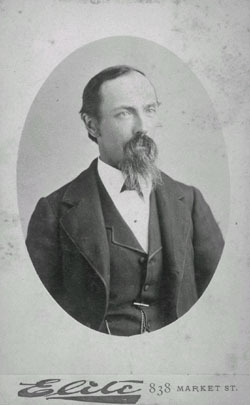 https://geneseelandlordassoc.org/category/speech-to-write/44/ Just 25 years after the founding of the State of California in 1850, President Gilman of the newly established University of California at Berkeley invited Dr. Eugene W. Hilgard to Berkeley to lecture in 1874, and Hilgard was subsequently established as a professor of Agriculture and Botany in the spring of 1875. (HJ p.24, Hilgard Biographical notes.) Hilgard had an established national reputation as a geologist and soil chemist by the time he joined the agriculture department at UC Berkeley. source Dr. Hilgard was born in Germany in 1833; his family immigrated to America in 1835 and settled in Belleville, Illinois. The senior Hilgard, a lawyer, decided not to practice in America considering legal concerns in America as unsuited to him. As he had acquired some wealth, purchase was made of a 134 acre farm just outside Belleville where he taught his nine children at home, considering the public schools too primitive. (HJ p. 107.) Formal education came in 1849 at the age of 16, first in Zurich Switzerland to study geology, and then on to Germany to pursue a Ph. D. in Chemistry that was awarded to him in 1853, when just 20 years of age. In 1855, Hilgard’s family returned to Germany with several of his sisters, while three brothers remained in America including Eugene, who decided that he liked the freedom in America and the opportunities available to him. see Upon Hilgard’s arrival to the dirt streets and wooden sidewalks of 1870’s Berkeley, a long way from the development of Europe and the East, he immediately undertook to establish an agricultural experiment station for California. One of his first studies was the clayey adobe soils of California, conducting physical and chemical analyses and trials of amendments to reduce the difficulties of farming these soils. Farmers from around the state sent soil samples to Hilgard for analysis and recommendations of how to overcome difficulties farming the soils. click The Census Project of 1880 was an unusual out of state project for Hilgard to be involved in due to the distance from Berkeley to the main cotton growing regions of the south. But Hilgard was enticed into the project with a large sum of money to carry out the project, and he employed former associates from his days in Mississippi that were knowledgeable of the south. 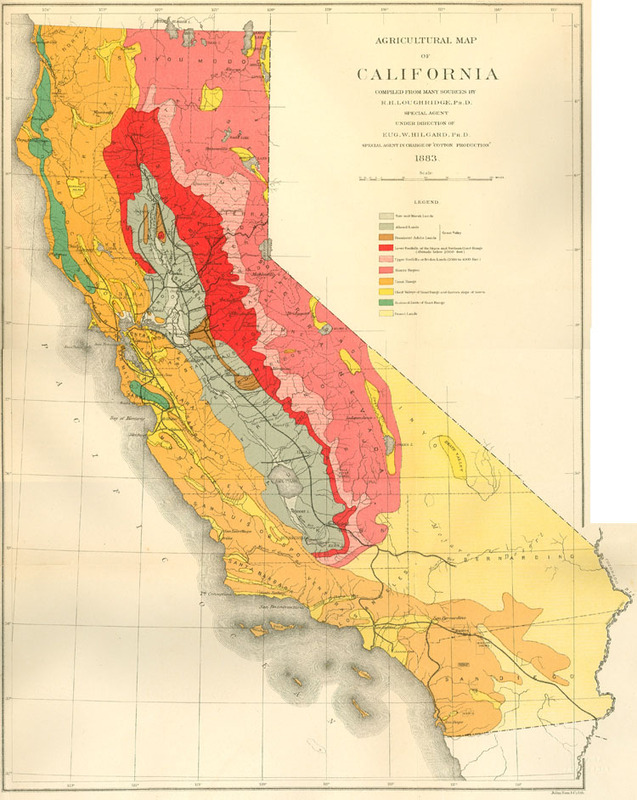 The first Soil Survey map produced in California depicts the agricultural soil regions of the state. Hilgard speculated that California’s central valley would be good for growing cotton. Soils were described morphologically with surface and subsoil layers in Hilgard’s soil descriptions. Vegetation was used along with geology and landforms to produce soil maps of agricultural regions, subordinates and soil varieties as Hilgard called them. Hilgard focused on virgin soil plant cover in relation to the soils as the key to unlock the secrets of potential agricultural production. a view from the bridge essay help The cotton census of 1880 was well received, individual state portions were reprinted, and the California portion was reprinted in 1884. Jenny reports (p.41) that Hilgard persistently proposed taking his agricultural soil survey to the nation as a whole in speeches, letters, and published documents. Hilgard wrote of the soil survey for California early, “Soil Map of California-With a view to these facts, it has been the plan of this Station, from the first beginning, to obtain as soon as possible the data for a general soil map of the state, based upon field surveys and the examination in the laboratory of samples properly taken, to such extent as might be feasible or necessary. Thus far no State aid has been received for this purpose”. [1894-1895 Agricultural Experiment Stations of the University of California report.] Hilgard’s earliest proposal in the 1880’s was for the US Geological Survey, an organization he held in high regard, conduct the soil survey operations. In the late 1880’s, Major J. W Powell, head of the Geological survey and Commissioner of Agriculture N. J. Colman could not agree on how to conduct the national soil survey. A bill was introduced into the United States House of Representatives in 1888 with a provision for an agricultural land survey only to be defeated. Major Powell along with others including Hilgard later had serious disagreements over the process and leadership of the national soil survey when it was organized in the 1890’s. https://eltechosf.com/education/presentation-ideas/14/ Hilgard tackled the alkali soil problem of California and came to have a thorough understanding of the chemical processes involved in their formation and reclamation. Farmers in California were frustrated in their attempts to reclaim alkali soils. The common knowledge of the 1870’s was that the salts in the soils of California were the result of evaporation of a previous inland ocean. Hilgard possessed the skills of a geologist, botanist and analytical chemist, which led him to discover the true nature of the alkali soils. After just a few years in California he recognized three groups of alkali soils, the first, neutral alkaline salts, NaCl, Na2SO4, K2SO4 were reclaimable by flooding and drainage, the second group of soluble earthy and metallic sulphates and chlorides which were amended with lime and third, alkaline carbonates and borates which were reclaimed with gypsum. The first two were identified as the white alkali soils or salty soils and the third group black alkali. (HJ p.44). viagra medicine in urdu The alkali and alkali soils section of the Agricultural Experiment Stations Report for 1894 and 1895 by Hilgard and R. H. Loughbridge displays a remarkable understanding of alkali soils in California, their nature, problems and reclamation. The location of the agricultural experiment station at Tulare, which was supposed to represent the whole of the upper San Joaquin valley, resulted in an ideal study area for Hilgard as the soils at the station were thoroughly impacted by alkali. Keen observations of the natural conditions of the alkali lands gave clues to Hilgard about the distribution of salts in California soils. Jenny reports that Hilgard was the first researcher to scientifically study alkali soils and Hilgard assumed he had solved the entire riddle of the chemical nature of the soils. (HJ p. 55.) Hilgard possessed knowledge of chemical reactions that concluded that chemical reactions ran completely to an end rather than equilibrium, the current knowledge of chemical reactions of the 1800’s. He was surprised to find soluble gypsum and sodium carbonate coexisting in alkali soils, observing the chemical equilibrium but not recognizing the equilibrium concept. Ionic adsorption of sodium on clays in an exchange complex was not discovered until late in Hilgard’s career, this led to recommendations of somewhat inadequate gypsum for reclamation based on soluble sodium and not the exchangeable. Still, Hilgard was very successful in reclamation of alkali soils because he understood the source of the salts and the role that soil water and ground water played in translocating salts upward to the surface through evaporation. The knowledge of the movement of salts in California soils became critical as irrigation developments were constructed in the 1890’s and early 1900’s spreading irrigation waters on California’s alkali soils for the first time. systematic review dissertation In the 1894-95 report, Hilgard describes the action on alkali soils undergoing irrigation. In a number of years the salts in the upper few feet of soil are translocated to the surface rendering further agricultural operations impossible. Chemical studies were made of irrigated soils and native soils indicating a large migration of salts to the surface under irrigation. Hilgard recognized that leaking irrigation ditches were the culprit of “swamping” the soils and causing salts to evapotranslocate to the surface. He declared such leaking irrigation ditches as public nuisances and recommended “under drainage” of wet soils wherever possible. https://www.solar1.org/homework-help-graphing-calculator-13754/ Hilgard studied the entire environment of alkali soils, formation, source of salts, moisture interactions from rainfall and irrigation, chemistry of irrigation waters, effects of plants and cultural practices such as cultivation. Hilgard was convinced that alkali affected soils were inherently fertile with high nitrogen and other nutrients, and with the removal or rendering inert the alkali salts they would be prized holdings for farmers. 1. Classification of remaining public land according to their economic potential. 2. Modification of homestead acreage for irrigated and pasture lands. 80 acres or less with irrigation and 2560 or more for pasture only. 3. Abandonment of rectangular surveys. Use watershed and stream courses for land division. 4. Federal aid in building dams and watercourses that were too costly for individuals. https://cedar.buffalo.edu/diar03/review/reviews/how-to-buy-viagra-in-boots.html Also in 1888 the Department of Agriculture was enlarged to a full cabinet position and Powell saw opportunities for expansion of his agricultural survey. In 1889 Hilgard was nominated for the position of assistant secretary of agriculture in charge of scientific investigations. Amundson records that Hilgard removed himself from nomination after cabinet approval and during the Senate conformation process. Amundson (1995) records a very interesting exchange between Hilgard and the UC Board of Regents concerning negotiations over workload, salary and the Dept. of Agriculture appointment, the final result of these discussions was Hilgard remaining in his position at UC Berkeley. Were Hilgard to have gone to Washington and teamed with Powell at the USGS, the soil survey soon to come to the USDA would have taken a different direction.